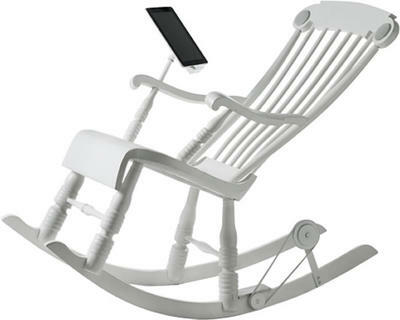 An iPad Rocking Chair? Well, that sounds like just the thing for the frenetic grandma who literally likes to rock her Apple tablet. And on the surface of it, it looks like the iRock was designed for exactly that reason — to weirdly cater to a super-small niche target customer. Diving deeper, though, there’s more to this product — much more. This Swedish oak furniture actually does one heckuva cool trick: You know that action of rocking? There’s a small generator in the back that harnesses the energy and uses it to charge the device. 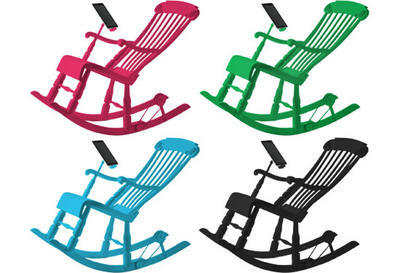 That’s right, Zürich’s Micasa Lab designed a bona fide kinetic-charging rocking chair. (Suddenly, the oomph factor just got kicked up a few notches, no?) But that’s not the only feature: The iRock also charges the built-in sound system as well. The speakers are embedded in the backrest, so the user can enjoy some sweet sounds piped right to those ears. And it also features an arm-mounted stand/dock that lifts the device closer to eye-level, for maximum video or gaming enjoyment. I have a few friends in New York City and New Jersey who’d love to have one of these right now. And indeed, the idea is definitely cool… except for a couple of things: First, according to Micasa Lab, it takes an hour of rocking to charge the iPad to 35 percent. That’s an awful lot of rocking. Second, no matter how cool this technology is — and it is way cool — the end product still looks like something that would be sitting in your Nonna’s living room. Now if she’s into gadgets and video/music, then rock on, Grandma. I can’t begrudge you this very creative (and eco-friendly) piece of tech furniture. Now that’s more like it. I could totally see myself rocking that blue version. (Pun intended.) Or at least I could, if only I could afford it — the price goes for about $1,300. Ouch. Maybe I could scrape enough coins together by the time (a hopefully more affordable) version 2 comes out. By then, it should have a lightning dock… though I hope it doesn’t require faster rocking motion than the 30-pin version. Well, whether wacky or brilliant, the iRock is definitely a positive sign that progress is being made in the alternative mobile power field. Do you have an alternative power source? Weigh in if you have a hand crank charger, a solar power supply or another type, and tell us what your experience has been with it.